“Retro rally racing” sounds like something Scooby Doo would say, but that’s what this little game is all about. An isometric racer that takes you back to a simpler digital era, when NES reigned supreme and games were really, really hard. 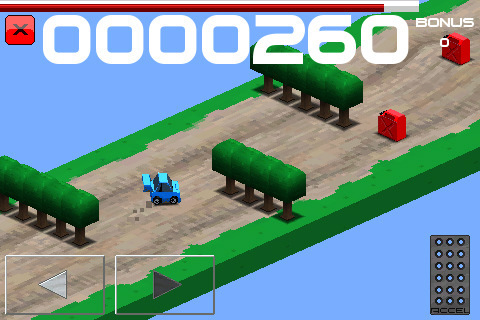 Cubed Rally Racer is also plenty of fun, but be prepared for death and failure at every turn. Tracks are randomly generated, so the game feels like new every time, but dying is as easy as breathing. All sorts of obstacles from jumps to cows bar the way to the end, so there’s never a dull moment, but there can be a fair bit of frustration as you crash and burn over and over again. Part of the difficulty lies in the game controls themselves, as the learning curve is intimidating. You have three buttons: left, right, and acceleration. It takes a light touch and a lot of practice to get the controls down, and a superhuman sense of precision and timing doesn’t hurt. There are no options for tilt controls or an onscreen wheel, so be ready for a lot of dying as you get the controls sorted out. There are also no railings, so pitching yourself off the edge is far easier than staying on the track, and you must constantly keep an eye on your fuel. Fuel consumption is a big part of the game, and snagging fuel cans along the way is vital, although this struck me as an unneeded layer of difficulty on an already difficult game. Despite the retro style, the animations and graphics are very smooth and charming. The simple and clean design is definitely a tip of hat to its classic gaming origins, but the game looks and handles like it belongs on the iPhone. Sound is minimal, however, and I would have loved to have had some old school chiptune music to better set the mood. More sorely lacking from the game is the sense of competition. Although you can challenge friends over OpenFeint to beat your best time, Cubed Rally Racer is effectively a single player game. You can race a ghost car of your best time, but the game really needs a multiplayer race option, either via wireless or Bluetooth. The current lack of multiplayer or even computer generated opponents stands out as a huge omission in a racing game. The sweet retro graphics and randomly generated tracks go a long way to making Cubed Rally Racer very appealing, but the steep learning curve may cause some to balk. I don’t think I can recommend this to gamers who cut their racing teeth on Mario Kart 64 or later games, but you R.C. Pro-Am fans out there should be totally golden. AppSafari review of Cubed Rally Racer was written by Tracy Yonemoto on June 7th, 2010 and categorized under App Store, Fun, Games, Racing. Page viewed 3216 times, 1 so far today. Need help on using these apps? Please read the Help Page.